This book explores how people may use music in ways that are helpful for them, especially in relation to a sense of wellbeing, belonging and participation. The central premise for the study is that help is not a decontextualized effect that music produces. The book contributes to the current discourse on music, culture and society and it is developed in dialogue with related areas of study, such as music sociology, ethnomusicology, community psychology and health promotion. 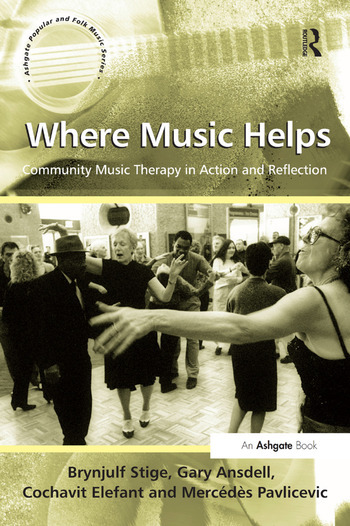 Where Music Helps describes the emerging movement that has been labelled Community Music Therapy, and it presents ethnographically informed case studies of eight music projects (localized in England, Israel, Norway, and South Africa). The various chapters of the book portray "music's help" in action within a broad range of contexts; with individuals, groups and communities - all of whom have been challenged by illness or disability, social and cultural disadvantage or injustice. Music and musicing has helped these people find their voice (literally and metaphorically); to be welcomed and to welcome, to be accepted and to accept, to be together in different and better ways, to project alternative messages about themselves or their community and to connect with others beyond their immediate environment. The overriding theme that is explored is how music comes to afford things in concert with its environments, which may suggest a way of accounting for the role of music in music therapy without reducing music to a secondary role in relation to the "therapeutic," that is, being "just" a symbol of psychological states, a stimulus, or a text reflecting socio-cultural content. Contents: Part I: Introduction: music and health in community; Situating authors and projects; Initial dialogue, Brynjulf Stige, Gary Ansdell, Cochavit Elefant and Mercédès Pavlicevic. Part II: Action: musicing on the edge: musical minds in East London, England; Reflection: belonging through musicing: explorations of musical community, Gary Ansdell. Part III: Action: - must we really end? Community integration of children in Raanana, Israel; Reflection: musical inclusion, intergroup relations, and community development, Cochavit Elefant. Part IV: Action: because it's cool. Community music therapy in Heideveld, South Africa; Reflection: let the music work: optimal moments of collaborative musicing, Mercédès Pavlicevic. Part V: Action: a society for all? The cultural festival in Sogn og Fjordane, Norway; Reflection: musical participation, social space, and everyday ritual, Brynjulf Stige. Part VI: Action: can everything become music? Scrap Metal in southern England; Reflection: where performing helps: processes and affordances of performance in community music therapy, Gary Ansdell. Part VII: Action: whose voice is heard? Performances and voices in the Renanim Choir in Israel; Reflection: giving voice: participatory action research with a marginalized group, Cochavit Elefant. Part VIII: Action: music in an ambiguous place: youth development outreach in Eersterust, South Africa; Reflection: crime, community, and everyday practice: music therapy as social activism, Mercédès Pavlicevic. Part IX: Action: caring for music: the Senior Choir in Sandane, Norway; Reflection: practising music as mutual care, Brynjulf Stige. Part X: Conclusion: when things take shape in relation to music: towards an ecological perspective on music's help, Brynjulf Stige, Gary Ansdell, Cochavit Elefant and Mercédès Pavlicevic; Bibliography; Index. Brynjulf Stige, PhD, is Professor in Music Therapy at the University of Bergen and Head of Research at GAMUT, The Grieg Academy Music Therapy Research Centre, Uni Health. Gary Ansdell, PhD, is Director of Education at Nordoff-Robbins, UK and Co-Director of the MA in Music Therapy (Community Music Therapy / Nordoff-Robbins). Cochavit Elefant, PhD is Associate Professor in Music Therapy at the University of Bergen. Mercédès Pavlicevic, PhD, is Director of Research at Nordoff-Robbins, UK and Associate Professor in Music Therapy at the University of Pretoria, South Africa. .